I got completely hung up on this album for the better part of a month and a half this fall. From its release date at the end of October to the present I've listened to it more than any other record this year by a good margin. Several things about it draw me back, some having to do with my own personal tastes, some to do with the remarkable talent assembled across these discs, but none more so than its genuine projection of community. This album dispenses that sentimentality in a mosaic of harmonious interplay and universal vibes from a global cast of musicians brought together by one of the true masterminds of the Chicago jazz scene. 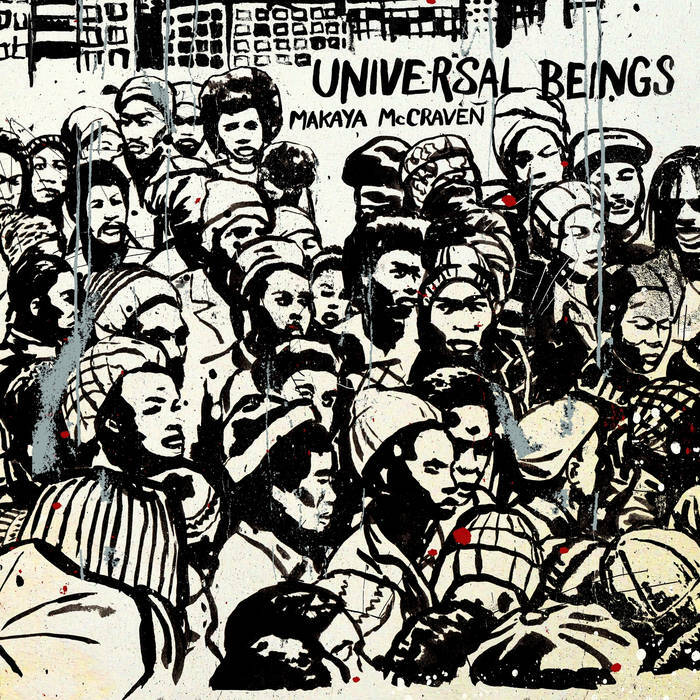 Universal Beings finds percussionist and producer Makaya McCraven playing with some of the best talent in creative music across four cities and two continents. The material from these meetings was then treated to McCraven's considerable post-production skills (also see Where We Come From - CHICAGOxLONDON Mixtape for a great companion to this album) and the resulting elixir has often been the only suitable treatment for my existential anxieties as we close out one of the most bizarre years in memory. That McCraven was able to work with such a diverse cast and have the resulting record sound as cohesive as it does is testament to his vision as much as his talent behind the mixing board. The album progresses linearly across four sides, marked by changes in locale and personnel which impart their distinct flavors to McCraven's ‘organic beat music’. The first two sides (New York and Chicago Sides, respectively) draw their material from live dates, while the second two (London and Los Angeles) are derived from studio sessions. Since jazz is all about celebrating the individual as a member of the whole, it's fitting that almost every song has a different featured musician (and every ensemble is coed). New York Side features a set recorded at Queens’ H0L0 in August of 2017 with the quintet of McCraven, Brandee Younger on harp, Joel Ross on vibes, Tomeka Reid on cello, and Dezron Douglas on double bass. After the brief, mood setting A Queen's Intro, Holy Lands (feat Brandee Younger) gets the album started properly with the featured artist's elevating harp figure floating on the groove provided by Douglas and McCraven. Joel Ross and Tomeka Reid in turn provide accents beneath a gorgeous solo from Younger. The refrain will have you unwittingly bobbing your head. Young Genius (feat Joel Ross) continues the feeling of the previous song, finding Younger and Ross providing the touchstones of the piece on harp and vibes, with Ross taking the fore as the featured musician this time around. Next is the more moody Black Lion (feat Dezron Douglas), finding the bassist rocking to a minor key vamp against McCraven's pyrotechnics. The combination of Reid, Ross, and Younger play counterpoint, leading naturally into Tall Tales (feat Tomeka Reid) where the American cellist lays down a gorgeous solo over the thudding foundation of McCraven and Douglas. Mantra feels like the statement piece from this group, with each member contributing to its minimalist vision of beat music. Chicago Side consists of material taken from a concert held at the Co-Prosperity Sphere in the neighborhood of Bridgeport in September of 2017. Here the quartet is comprised of McCraven, cellist Tomeka Reid, Junius Paul on double bass, and Shabaka Hutchings on tenor saxophone. Pharoah's Intro is comprised of some tasty saxophone/cello/drums interaction that warms you up for one of my favorite pieces of the year, Atlantic Black. There is some tremendously quick interplay between Hutchings and Reid right off the jump that quickens into a vamp before the counterpoint resumes, after that McCraven works his studio magic, snatching samples of the interplay and weaving them into kaleidoscopic displays of rhythm that dissolve at around six minutes then built it back up again slowly around extremely soulful saxophone passages. Inner Flight is initially systematically rhythmic before breaking down into a great back-and-forth between Reid and Hutchings. Wise Man, Wiser woman (feat Shabaka Hutchings) contains another great saxophone riff played with sincerity by Hutchings and complemented with delectably overdriven runs and bow slashes from Reid. On Prosperity's Fear (feat Junius Paul) the band plays like fire, consuming all the available air in the room and leaving ash behind. London Side was recorded at Total Refreshment, a nightclub in Stoke Newington where the material for the aforementioned Where We Come From was taken. This session features the quartet of McCraven, Nubya Garcia on tenor saxophone, Ashley Henry on Rhodes, and Daniel Casimir on double bass. “So d’you guys wanna play something?” begins Flipped OUT, which hops along on a strident beat from McCraven mounted by Henry’s Rhodes and Casimir on bass. Periodically Garcia shows up, providing an angular sax riff or emphasis. Flipped OUT drifts right into Voila (feat Daniel Casimir) , where Casimir plays splendid arco over the solid rhythm mechanics and post production. Garcia again emerges towards the latter half with smooth accents and a short but powerful solo to round out the piece. Suite Haus (feat Nubya Garcia) highlights the saxophonists’ Sonny Rollins-esque tone throughout, setting up a chopped and screwed loop + Rhodes section to close out the piece. Next comes The Newbies Lift Off (feat Ashley Henry), where Henry is given ample room to stretch out on the Rhodes, which sounds tremendously warm and at home over the crisp beats, sax swells, and Casimir’s absolute noggin’ bobber of a bass line. The side winds down with The Royal Outro, laying down some chatter from the London session over top of the smooth instrumental hip hop. Los Angeles Side was recorded in guitarist Jeff Parker’s current residence in Altadena, Los Angeles County at the end of January, 2018. The line-up on this side consists of of McCraven, Jeff Parker, Josh Johnson on alto saxophone, Miguel Atwood-Ferguson on violin, Anna Butterss on double bass, and Carlos Nino on percussion. The Count Off (feat Carlos Nino) begins more suddenly than any other song on this absolutely laid back collection. The drums are fast and the guitar and sax are blistering. It's short and sweet and serves as mental smelling salts to snap the listener from their trance. McCraven again spices these songs up by utilizing outtakes of quips and banter from the recording session, a reminder of the humanity involved in the process. Butterss's (feat Anna Butterss) is a palm-muted guitar and violin fantasia built off a backbone provided by the smooth as satin bass playing of Anna Butterss. Turtle Tricks features the familiar guitar sound of host Jeff Parker, who many of us grew up listening to as a member of Tortoise and who is also a huge influence on McCraven's music. His brilliant playing adds the tint of nostalgia to these LA pieces and is also a central component of The Fifth Monk where the groove is built around the guitar and violin and highlighted with melodic lines from Josh Johnson's horn. The next piece Brighter Days Beginning (feat Josh Johnson) is a quiet, understated piece of airy saxophone, guitar, and rustling percussion. Overdubbed a top the music is a conversation among the musicians discussing the potential of humanity and the frustration at our lack of progress, invoking the album title in their talk. 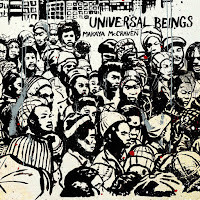 Universal Beings (feat Migel Atwood Ferguson) closes out the album with over a scrappy McCraven beat, pocked with Parker's staccato guitar and accented by Johnson and Nino all riding out the storm that is Atwood-Ferguson. By the time it's over I'm exhausted from the weight of the album, but when I go to put something else on this is all I want to hear. The key to what makes this all so compelling for me is the concise minimalist hip hop style underlying the entire effort and the understated recording technique finding McCraven using only a couple of room mics to capture the performances. The way he and then slices and dices the results to mold it into his signature sound is a unique approach that works marvelously. The audio artifacts provided by the local ambience are treated the same as the rest of the source material giving the sound a natural resonance that lacks in a lot of sample based music. That the improvisations are augmented in the studio is an obvious nod to dub and to modern studio magicians like Jeff Parker and Tortoise and it makes McCraven’s music unique in that the overall effort is a group one (again with that community thing), even if the maestro still has the final say. Anyway, it's an exciting and innovative time for Chicago jazz and International Anthem is doing a phenomenal job of getting it recorded and out to the people, highly recommended. Great review of a great album. It's to McCraven's credit that he moulds such a winningly signature style from such disparate elements whilst respecting the individual contributions and maintaining such a consistently high standard throughout. To me it sounds more organic and less restrictive than his earlier, also impressive, releases that have tended to feature a smaller number of musicians. And on a purely parochial note, it's good to hear such crucial representation from London! Thanks MJG! His CHICAGOXLONDON events are brilliant, we can only hope that multi-scene collaborations catch on.